A Quakertown Community School District teacher, who made life mis­er­able for quar­ter­backs as a col­lege defen­sive end, has been induct­ed into the Moravian Athletic Hall of Fame. That defense includ­ed Shawn Storm, a seventh‐grade read­ing teacher at Strayer Middle School, who start­ed at the oth­er defen­sive end posi­tion for the Greyhounds. “We played on one of the best defens­es in the his­to­ry of Moravian College,” Mr. Storm said. “The front four on that defense was tena­cious. We com­ple­ment­ed each oth­er so much and gen­uine­ly cared about each oth­er. “Cus was a qui­et, lead by exam­ple type of guy for that defense, which was nice because I did all the talk­ing for us both. We both played the same posi­tion — oppo­site sides, so I worked with him every day. I got to wit­ness first hand his relent­less work eth­ic and ath­let­ic skill. There were many games where we’d be lin­ing up and I’d yell over to him ‘Meet you at the quar­ter­back.’ He got there a few times before me, but we both cel­e­brat­ed each oth­er. Not sur­pris­ing­ly for a future teacher, Mr. Cusumano was equal­ly adept in the class­room as the grid­iron. The 1998 Moravian grad­u­ate, who trans­ferred from Millersville University after his fresh­man year, was select­ed to the Middle Atlantic Conference All‐Star First Team in both 1995 and 1997, and he also earned a spot on the GTE/CoSIDA Academic All‐District Team as a senior and the Hewlett‐Packard Honorable Mention All‐America Team as a sopho­more. 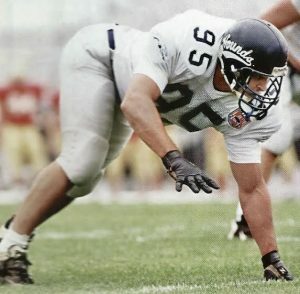 He was on the 1995 and 1997 MAC All‐Academic Teams, and besides his 27 sacks he added 100 tack­les, three fum­ble recov­er­ies includ­ing one for a touch­down in 1997, and two pass break‐ups. 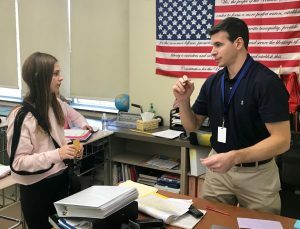 After grad­u­at­ing from Moravian, Mr. Cusumano was hired by QCSD to teach fifth grade at Tohickon Valley Elementary School. Two years lat­er he moved to Milford Middle School, where he remained until its clos­ing, and has been at SGC since it opened last year.